Great excitement at Dale Towers in the last few minutes as the first couple of thousand copies of my Blogging Guide have arrived from the printers. I'm really pleased with the look and feel of it. For those of you who are attending the Party conferences, you'll be able to pick up your copies there. For those who aren't you can buy a copy HERE. 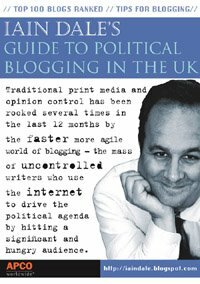 Anyway, the purpose of this post is to give you my fourth extract from the Guide to Political Blogging. This time it's my Top 100 Non Aligned Political Blogs. Some of you may think several ought to be in party political sections, or verge on the non political. In the end it's all about subjective judgments, isn't it? I want to emphasise that this Top 100 and the rankings are my opinion and obviously opinions are subjective. But the list should at least generate a debate. I marked each blog out of ten on the following 10 areas: design; frequency of posting; writing ability; personality; comment; humour; range; interaction; popularity; independence of thought. This generated a mark out of 100. To download the Top 100 Non Aligned Political Blogs as a PDF, click HERE. I will be uploading the full document as a PDF on Monday morning. You can get a dead tree version HERE. The Top 100 LibDem Blogs PDF is HERE, Top 100 Labour Blogs HERE and the Top 100 Tory Blogs are HERE. Do free to let me know what you think of all of them. By the way, I'll be doing the papers on News 24 tonight at 11.45pm if you're interested. Sabretache is doing well. He's in the Conservative list (96) AND the non-aligned list (60). Prodicus, first prize goes to you for spotting the first error! Room for Andrea Leadsom in the Conservative list now. I think its a great concept. As with these kind of things they are almost immediately out of date - but they will not only add to the overall awareness of blogging, and political blogging in particular - but will hopefully spur people on to improve their offerings, which can only raise the bar for the next edition! Woo! I'm chuffed. Thank you very much for including my blog, Iain. You'll no doubt get lots of queries, a few critics, and a bit of cavilling, but it's a huge undertaking you've completed and you should be commended for it. I'm only saying that because I'm on one of the lists, of course. Well, that’s pretty good, all three of the UK blogs I write for are well up there (my own, ASI and SAU). I would cavil slightly about some of them, Nick Cohen is simple reprints of articles elsewhere, ditto Boris J. but as above, you’ve done a huge amount of work so well done. There’ll be a number of additions to my bloglines account from this. I don't know what's worse... being ranked only 89th or coming so far behind the likes of both Jeffrey Archer AND Paul Leake.... I despair. Thanks Iain, and well done on all your hard work. Many thanks Iain. What a fantastic and worthwhile resource you’ve produced in compiling this list. Now I can go back to jumping up and down excitedly with the number 19 smeared on my chest in marmite? And to think: some people questioned my sanity. Many many thanks. Prodicus-well spotted. Is your "Official List of Lousy Bastards" still going strong? I was in such a hurry to give Mr Vaizey a piece of my mind I forgot to say thanks for the inclusion on the list. Many thanks. I'm tickled pink that you have rated me 16 on the Top 100 Lib Dem blogs list. Definitely given me the boost to continue. I believe in saying it as it is and not writing just to please others. Am amazed at the amount of work you have put in to compile the lists of blogs. Never knew half of them existed. Have you actually reviewed all of the blogs one by one? What a mammoth task in such a short time. Paul Leak resigned from the party last year after a disagreement with his council group leader over his blog. Least that's what he wrote in his blog. Tim, the feed works. Gareth has it working on the Witanagemot aggregator. Drop him a line, I'm sure he'll tell you how to get to it. Does anyone know what has happened to the Striking a Balance Blog? It has disappeared into the Blogosphere Black Hole. Thanks ever so much for including me. How on Earth did I end up in the top 30? I certainly wasn't expecting it! Thank you for absolutely making my day with such a pleasant surprise. I must say, well done to you Iain for the list (even though I don't appear to be on any of them). There good lists, and I look forward to seeing your 2007 top 100 political blogs. Iain (blessings be upon you) - you've ensured my students tomorrow will receive free Mars bars, as much Coke and caffeine as they can handle and be allowed to watch interesting films rather than study Shakespeare! I will however work them twice ashard on Wednesday! Most kind of you to visit all those blogs and mark them. Can you confirm that you DID get the £10 note I sent? Cheers! Sorry, I've only just got around to downloading the pdf and was surprised - and humbled - to make the non-aligned list.